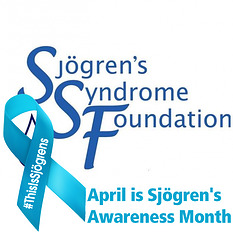 April is Sjögren’s Awareness Month and to better portray the entire patient experience, the Sjögren’s Syndrome Foundation (SSF) is using facts and figures from our recent “Living with Sjögren’s” patient survey in our This Is Sjögren’s 2017 April Awareness Campaign. This survey, which was conducted by Harris Poll on behalf of the SSF, gave the Foundation amazing data about how patients’ lives are affected by Sjögren’s, what symptoms and complications patients live with and how the disease affects their emotional and financial well-being. For the overwhelming majority of Sjögren’s patients, coping with the disease every day, is a limits ones ability to function at home and in the workplace, according to our survey. As patients know, Sjögren’s is a systemic autoimmune disease that affects the entire body and affects approximately one-percent of the U.S. population. Sjögren’s is often referred to as an invisible disease, one that, while patients may experience extreme discomfort, people don’t physically see, which leads to a misunderstanding about the seriousness of the disease. If you break a bone and wear a cast others can see your injury and understand your limitations. But with Sjögren’s, your symptoms are not clearly visible so not only do you have to put up with challenging, often painful, and sometimes debilitating conditions every day, but you may face disbelief from family, friends, co-workers, and even doctors, who don’t understand what’s wrong with you. 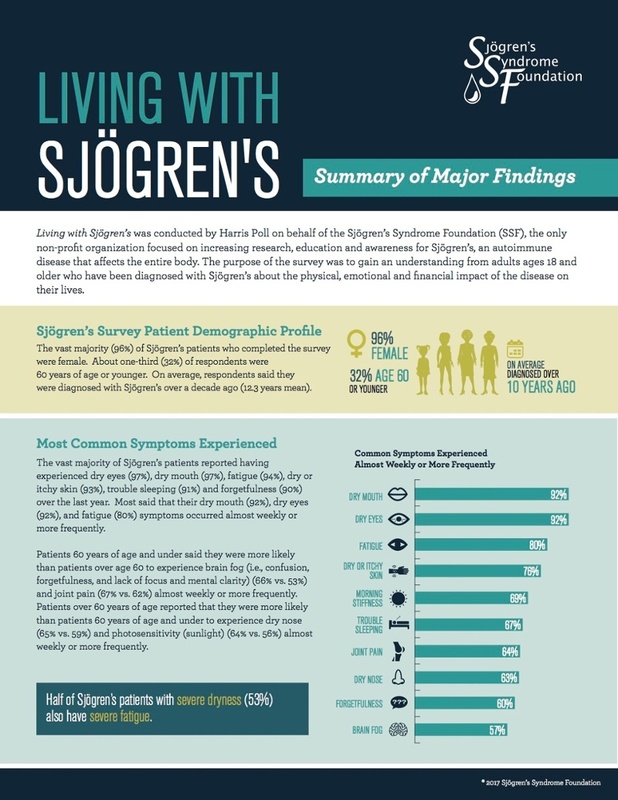 The “Living with Sjögren’s: Summary of Major Findings” brings to the forefront the significant quality of life challenges faced by Sjögren’s patients. Below you will find the “Living with Sjögren’s: Summary of Major Findings” (or view full Report here). I encourage you to share this with your family and friends to help start a conversation about living with Sjögren’s and how it affects you. The SSF knows, that as we help others understand the disease, the more support patients will find. And please know that the Sjögren’s Syndrome Foundation is always fighting for you and ensuring that the patient voice is heard! We are committed to accelerating the development of better diagnostic, management and therapeutics that will have the greatest potential impact on improving the quality of life for Sjögren’s patients. For reprint permission requests, please contact us at info@sjogrens.org. Help support the SSF's 5-Year Breakthrough Goal initiatives by donating.